Most people could probably name the state bird or the state tree, but what about the state gem? The state grass? State fruit? Do you know why they are important to Utah? Here are just a few of Utah’s State Symbols that you might not have known. 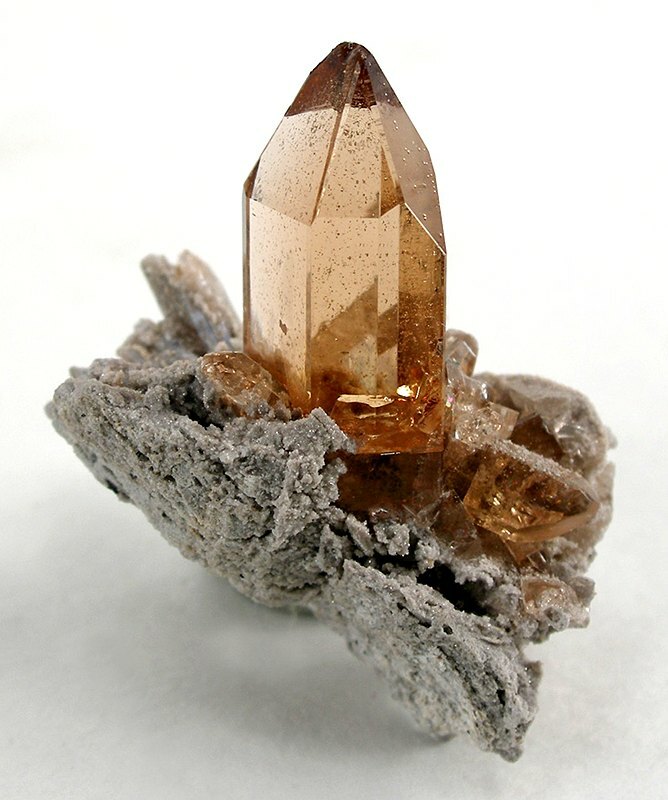 Topaz was named Utah’s state gem in 1969 because of its abundance on Topaz or Thomas Mountain in Juab County. In this area, perfect topaz crystals can be found and collected. This semiprecious gem can also be found in Beaver and Toole counties. Topaz can be found in a variety of colors, but in the Thomas Range it is known for its sherry hue. When exposed to sunlight, amber colored topaz will often become clear. Topaz collecting is free and open to the public in most areas and could be a great way to get to know Utah a little bit better. Utah’s state grass was selected in 1990 to be Indian Ricegrass. As you might suspect, indian ricegrass was given its name because of the significance in Native American life. This tough bunchgrass was a common food source and was absolutely crucial to survival when the corn crop failed. 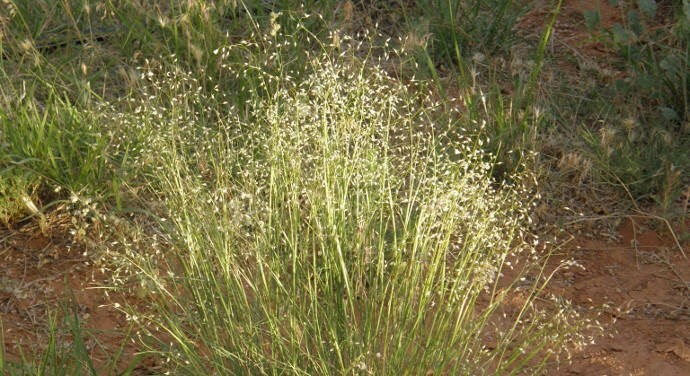 It can be found in wet and dry areas throughout the West. Long ago this grass was important for Native Americans; now it is important in fighting wind erosion and grazing cattle. The cherry did not become the state fruit until 1997 when a group of second graders did their research and petitioned for the fruit to be recognized. Cherry was discovered to be the most economically beneficial fruit for Utah when compared to other fruits like peaches and apples. Both sweet and tart cherries are grown commercially in Utah. 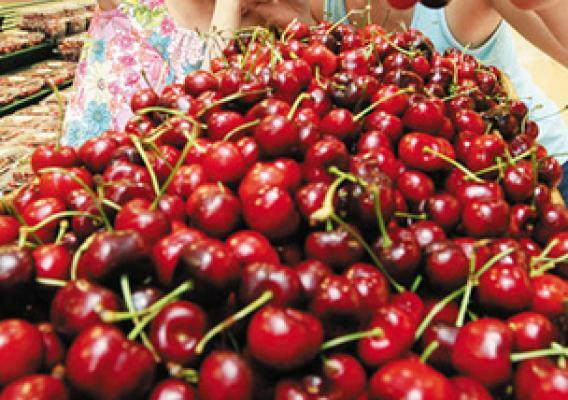 Utah is the only state ranked in the top five cherry producing states for both types of cherries. The cherry is native to Asia, but flourishes in Utah’s environment. The state insect might be a little easier to guess than the state grass and state fruit. Utah is known as the beehive state, so naturally our state insect is the honeybee. When settlers first arrived in Utah they called it Deseret which means honeybee. Some native bees are listed as endangered species, but many Utahns have become “backyard beekeepers” to help these bees survive. Bees might seem insignificant, but are actually the unsung heroes of the world’s food supply. 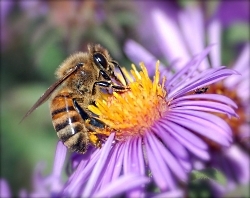 Growing bee friendly plants or becoming a beekeeper yourself are great ways to help Utah’s honeybee thrive. This is Aspen Flake and I am Wild About Utah. Utah is arguably blessed with the most stunning landscapes on the planet. Many have been preserved for posterity in our National Parks & Monuments. This is the BIG YEAR- the 100 year anniversary of the National Park Service! I’ve sampled and worked in many of them- from Alaska to Florida, from S. California to New England. As many would suggest- our National Parks are one of America’s greatest achievements which has gone global, now found on all continents except Antarctica (or am I missing one!). Much of my work in the Parks has been assisting with the launch of the “Climate Friendly Parks” program which began in 2006. The program provides parks with the tools and resources to address climate change and ensure the most sustainable operations across the agency. National parks, because of their location and unique, protected resources, are places where the effects of climate change are particularly noticeable. With the establishment of the National Park Service in 1916, responsibility was given to the Service to preserve and protect the significant resources within parks for the enjoyment of current and future generations. Today, as knowledge about climate change and its effects increase and potential impacts are better understood, the need to practice good stewardship and develop forward thinking resource management plans is more relevant than ever. I began in Zion N.P. then moved on to several others including Mt. Rainier, Olympic, Rocky Mountain, and Denali in Alaska. Zion N.P. will always be at or near the top for its amazing landforms, shear grandeur, hidden canyons, and rich diversity of life- the highest in Utah. It was here that I first met the ringtail cat and Mexican Spotted Owl- two illusive, iconic critters. Both appeared in broad daylight in Hidden Canyon on the west face of the Great White Throne. There is no season less than spectacular here. Perhaps the most dramatic accompanies the seasonal monster thunder storms amplified by massive sandstone cliffs which begin spouting 2000 foot blood red waterfalls. It’s all too surreal, too ethereal for one’s senses to fully grasp. And yet another proposed stunning Utah landscape containing thousands of ancient ruins is receiving wide citizen support including many native tribes, that being the Bears Ears NationalMonument. This area of South Eastern Utah offers a unique opportunity to include the “real Americans”, the people that have over 10,000 years of Utah history, who continue to honor and worship this ancient landscape of their ancestors. These tribes have been invited to participate in its planning and management to assure their rituals and subsistence ways may continue, and that its pristine nature would be preserved in perpetuity. Designation of the Bears Ears NM would be a marvelous celebratory note for this epic year to honor America’s grandest idea! This is Jack Greene for Wild About Utah. 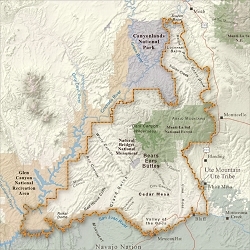 Courtesy BearsEarsCoalition.org for the map of the proposed Bears Ears National Monument. Hi, I’m Ru Mahoney with Stokes Nature Center in Logan Canyon. Utah’s culture is rich with vestiges of our pioneer history, and the landscape is accented by visible signs of the European settlers who forged our modern communities. But the tapestry of Utah’s cultural heritage is interwoven with much older threads, as indelible and enduring as the landscape itself. In the 1980’s, in the southwestern quadrant of central Utah, the construction of interstate 70 unearthed a secret over one thousand years old. The valleys and canyons of what is now Sevier County, already known as a seasonal thoroughfare for the Paiute, had an even older history as home to the largest community of Fremont Indians ever discovered. Influenced by their Anasazi cousins to the southwest, the Fremont culture encompassed a diverse group of tribes that inhabited the western Colorado Plateau and the Great Basin area from roughly 400 to 1350 A.D. Archaeologists tell us they were a people of ingenuity in their engineering, aggression in their social interactions, and lasting creativity in their artistic expression. Divergent theories on their fate suggest they drove the Anasazi out of the Four Corners region and eventually migrated to further landscapes, or that northern groups of Fremont peoples joined with bands of Shoshone and became the Ute Indians of the Uinta. Whatever the truth of their ultimate fate may be, nowhere is their history more tangible than at Fremont Indian State Park just south of Sevier, UT along I-70. This year-round state park offers visitors a treasure trove of artifacts and curated exhibits in an excellent visitor’s center. But the most authentic interaction with these past peoples comes from exploring the surrounding landscape. Driving the winding road into Clear Creek Canyon, ghostly figures begin to emerge; pictographs painted in shades of ocher and umber, and pale petroglyphs carved into the canyon walls, reveal an archaic and epic account of Utah’s ancestral past. A unique creation story, in which a shrike leads the Fremont people from a dark and cold underworld through the stem of reed into the warm world above, plays out across the canyon walls. A craggy outcrop of rock in the shape of an eagle is said to be watching over the reed to the underworld below to insure nothing wicked escapes into our world. A concentric lunar calendar and an abundance of zoomorphics speak of a cultural identity conceived in relation to the broader astrological world, and a reverence for anthropomorphized neighbors such as bighorn sheep and elk. Spider Woman Rock juxtaposes a powerful figure of Native American mythology with the pedestrian humility of a nursing mother. And Cave of 100 Hands is a visceral exhibition of a humanity simultaneously reminiscent and divergent from our own. 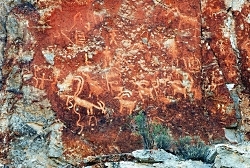 While the Fremont culture is believed to have died out or been absorbed by other modern groups, Clear Creek Canyon and the rock art sites of Fremont Indian State Park are significant among the modern Kanosh and Koosharem Bands of the Paiute who began using the area and leaving their own indelible marks on the canyon walls after the disappearance of the Fremont peoples around 1400 A.D. On the vernal and autumnal equinox (occurring in the third or fourth week of March and September each year) the eagle rock casts its shadow over the reed rock at dawn, breathing life into ancient tales of our ancestral history. Fremont Indian State Park is a notable destination for those interested in rock art sites, many of which are suited to families of all ages and mobility, including visitors with strollers and wheelchairs. Stop in the visitor’s center to borrow or purchase a guide to the petroglyphs and pictographs for deeper insight into the Fremont culture and an unforgettable glimpse into Utah’s past. For Wild About Utah and Stokes Nature Center, I’m Ru Mahoney. Text: Ru Mahoney, Stokes Nature Center in Logan Canyon. Arizona is rich in history — from the 1800s all the way back to the Late Triassic Period. You can stitch together a road trip that winds out of Flagstaff to Montezuma Castle National Monument, to Petrified Forest National Park, and ends at Hubbell Trading Post National Historic Site. Along the way you’ll experience fascinating chapters of geologic and cultural history. 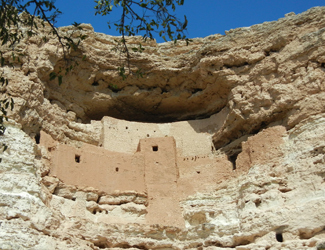 At Montezuma Castle, 45 minutes south of Flagstaff and just off Interstate 17 (Exit 289), a short walk places you in front of a 5-story-tall cliff dwelling that offered safety from invaders: it stands 100 feet above the valley floor, nestled into an alcove. The site was misnamed Montezuma Castle in the late 1800s by whites who thought the structure had been built by the Aztec people. The original owners, members of the Southern Sinagua (seen aug wah) people, called this area home from roughly 1100-1425 A.D.
Stroll the short trail that loops around a vegetated landscape below the “castle,” and you’ll find great views as well of the remains of Castle A. That dwelling once rose 60 feet and was home to about 100 residents. From Montezuma’s Castle, it’s 95 miles via Arizona 87 to Winslow, and then 34 miles east on Interstate 40 to Holbrook. Finally, another 19 miles southeast on Arizona 180 leads you into Petrified Forest National Park and its unusual landscape. There’s no lodging within the park, and you have to leave by sundown, so you will need to make some tough decisions if you have just one day. Do you take time to tour the Rainbow Forest Museum with its dinosaur displays, or hike out to Agate House? A building built of petrified wood is pretty cool, so stretch your legs with a walk to the house. Then head north and deeper into the park to the Crystal Forest Trail. Wander this path and you’ll find yourself surrounded by petrified wood with its hues of yellow, red, and green, black and white. Blue Mesa is another great stop. There’s a trail that takes you down into another colorful landscape of badlands and chunks, logs, and even slabs of petrified wood in shades of red, blue, yellow and black. The northern end of the park road is anchored by the Painted Desert, a great place for sunset photos. Here you’ll also see the Painted Desert Inn, which some day could put the Park Service back into the lodging business but today is just a museum piece. Back on Interstate 40, drive 22 miles east to Chambers, and then north on U.S. 191 for about 38 miles to Ganado and Hubbell Trading Post. 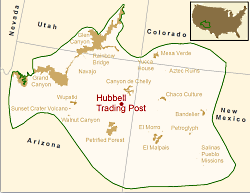 This authentic trading post was opened by John Lorenzo Hubbell in 1878 on the Navajo Reservation. 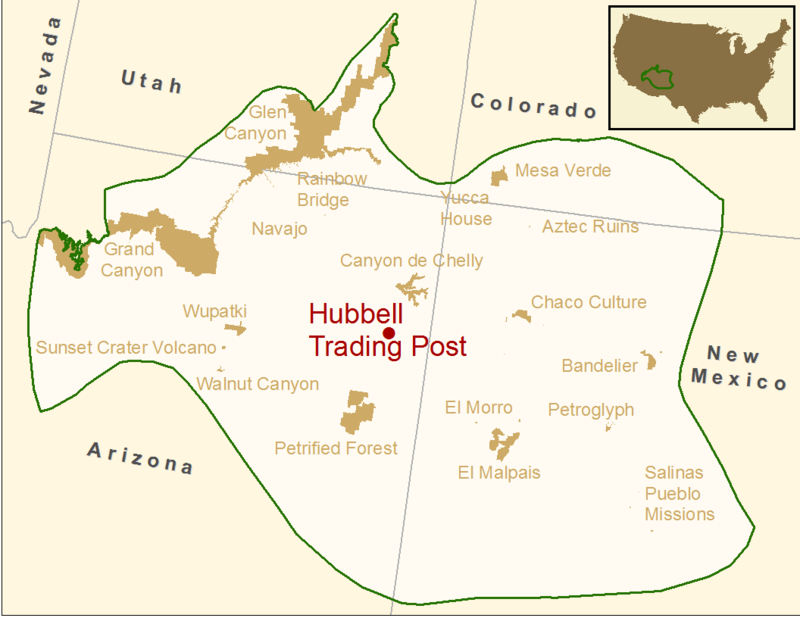 Although it was added to the National Park System in 1967, Hubbell is not a museum piece but an active trading post. 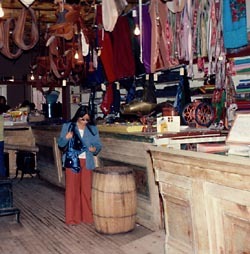 As such, it still holds richly woven Navajo rugs, jewelry, and other Native American artworks for purchase. Schedule your visit to Hubbell Trading Post for May and you just might be able to attend the annual Native American Art Auction. Check with the park (928-755-3475) for the exact date. If you have a little more free time, you could extend your your trip by heading 39 miles north on 191 to Canyon de Chelly National Monument. For Wild About Utah and National Parks Traveler, I’m Kurt Repanshek.